Read the full Facebook Post here. 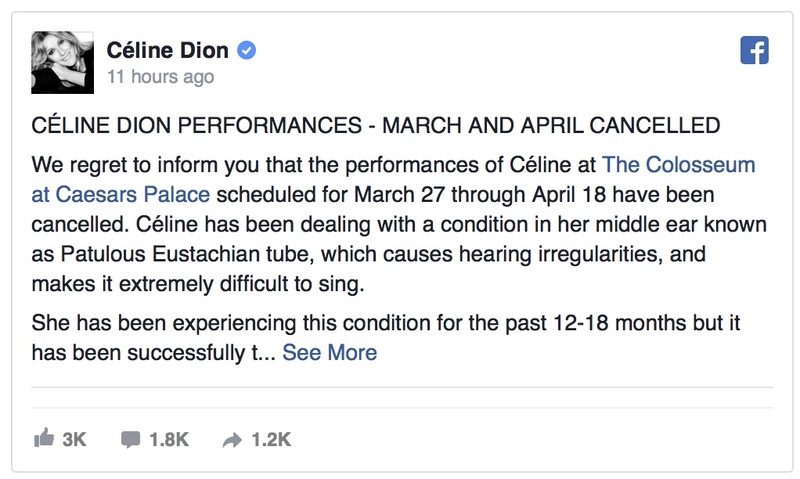 On March 21, 2018, Celine Dion announced on Facebook that she is cancelling her concerts in March and April 2018 due to "Patulous Eustachian Tube," a middle ear condition that causes hearing problems. In a normal human middle ear, there is a tunnel that connects to the back of the nose. When pressure builds up in the middle ear such as going up in an airplane, an individual is able to "pop" the ear thereby releasing the pressure and alleviating the clogging sensation. When this tunnel, called the eustachian tube, becomes swollen shut, an individual is unable to pop the ear causing a persistent clogged ear sensation. This particular scenario is called Eustachian Tube Dysfunction. Watch the video below that further demonstrates how the eustachian tube works. 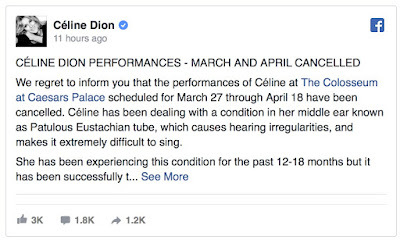 However, what Celine Dion is suffering from is the extreme opposite of Eustachian Tube Dysfunction. Her eustachian tube is TOO widely open. Although this would obviously prevent pressure buildup in the middle ear, a too widely open eustachian tube causes other problems. She would hear herself breathing in and out thru the nose as the air passes by the opening of the eustachian tube. Whenever she talks or sings, she would hear herself echoing up into her ear and head. Patients often state that it feels like they are talking in a barrel. This symptom is often temporarily alleviated by placing the head down below the knees or by constantly sniffing forcefully. Medications like SSKI and estrogen nasal spray may help with Patulous Eustachian Tube, but often do not work. Surgical treatment is basically to plug up the eustachian tube. One promising surgical method is to insert a catheter into the eustachian tube via the nose, an endoscopic technique first described by Dr. Dennis Poe in Boston.